Apple recently introduced a new policy that only lets you purchase the iPhone using a credit card. They think this will help stop the reselling trend and keep the supply available for regular customer demand. I completely disagree with this policy and will never buy an iPhone under these new rules. 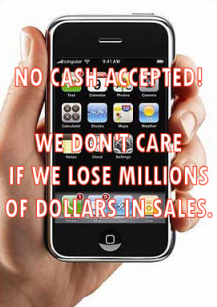 No, I don’t resell iPhones, but I think that when a company refuses to accept cash then something is definitely wrong. I brought up this issue in a message forum over the weekend and many responded with the same feelings I have. Many of the respondents are high school and university students who don’t even own credit cards. How are they supposed to buy an iPhone now? Steal one? It’s not just students who shared their opinion with me, but other readers in their 20’s and 30’s who don’t feel the need to own a credit card and prefer paying for everything in cash. Apple is making a huge mistake by implementing this new policy, which I use the term lightly, because it’s not a policy, but rather consumer bullying in my opinion. Just when I was seriously considering buying an iMac before Christmas, Apple has to repel me with their corporate power stick waving. Sorry Apple, no big computer sales for you coming out of my wallet. Don’t have a credit card? Tough luck – Apple doesn’t want you as a customer! And I don’t want to be one anyway. Read one college kid’s experience while trying to buy an iPhone under these new rules. Yahoo! News also reports on Apple’s new restrictions. I agree with you, Chris. Good post. It might be a scheme from Apple to spark some new interest and news about the iPhone. This and the thousands of posts about this topic is proof of it. I’m sure they will relift the policy soon to make another killing from the craze. How does restricting people to using only credit cards to purchase the iPhone stop them from reselling?? I think they check your number to see if you’ve made any other iPhone purchases before. They also won’t allow you to use a gift card to buy one as well.